Peri-orbital cellulitis is an infection of the periorbital soft tissue characterised by erythema and oedema. There are significant consequence such as leading to both vision and life-threatening consequences, if not treated appropriately. This article will discuss the epidemiology, pathophysiology, clinical features, diagnosis, management and complications of peri-orbital cellulitis. Peri-orbital cellulitis is a disease primarily of children and adolescents with an age distribution ranging between 0–15 years, and a peak incidence in children younger than 10 years. As a result, it is much more common in adolescence than adulthood, as well as being twice as common amongst males when compared to females. There is bi-modal seasonal variation, with peak occurrence in late winter/early spring, attributed to the increased incidence of upper respiratory tract infection and paranasal sinusitis in the same seasons of the year. Peri-orbital cellulitis occurs in 35% of children with sinus-related infections, and accounts for 0.3-1.3 cases per month at a tertiary referral centre typically. Peri-orbital cellulitis is divided into two forms; namely pre-septal and post-septal cellulitis. The important divide here is the orbital septum, which is a thin, fibrous, multilaminated structure that attaches peripherally to the periosteum of the orbital margin to form the arcus marginalis. Infection anterior to the septum is pre-septal and posterior is post-septal. The orbital septum is the only barrier impeding spread of infection from the eyelid into the orbit. Commonly peri-orbital cellulitis occurs as a result of contiguous spread from surrounding periorbital structures such as the paranasal sinuses (figure 1). Ethmoidal sinusitis is the most common cause of orbital cellulitis, especially in neonates who have not yet formed their frontal sinuses. It most frequently occurs in young children because of the thinner and dehiscent bone surface of their lamina papyracea and increased diploic venous supply in comparison with adulthood, in addition to relatively incomplete immunologic development in this age group. These conditions predispose children to infectious spreading from the ethmoid sinus to the near peri-orbital and orbital space, thus leading to a continuum of clinical disease patterns ranging from relatively mild periorbital cellulitis to a sight-threatening orbital abscess. Up to 38% of children may have multiple sinus involvement. Other causes include dacrocystitis, dental infection, endophthalmitis, trauma, foreign bodies, insect bites, skin infections (impetigo), eyelid lesions (chalazia, hordeola), and iatrogenic causes such as eyelid and oral procedures. 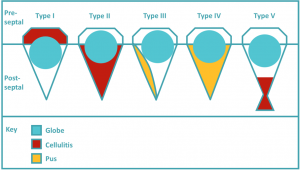 Historically, haemophilus influenza type B was one of the most common organisms associated with pre-septal and orbital cellulitis in children, prior to the introduction and widespread adoption of the HiB vaccine in 1985. This resulted in a possible change in microbiology. Organisms are those generally responsible for acute rhinosinusitis, such as Streptococcus pneumoniae, Haemophilus influenzae, Moraxella catarrhalis, Staphylococcus aureus, group A streptococcus, and upper respiratory tract anaerobes. Staphylococcus aureus is usually the most common pathogen. Clinical features vary secondary to infective process. Typically, patients with pre-septal infections present with eyelid oedema and erythema of the upper eyelid, with an absence of orbital signs. As such, patients with pre-septal cellulitis will present with normal vision, absence of proptosis, and full ocular motility without pain on movement. The swelling reflects an impedance to drainage through ethmoid vessels. Due to the superficial nature, erythema may spread to upper cheek and brow area. There is usually a history of acute sinusitis or upper respiratory tract infection in the days preceding the development of eyelid oedema. This can be found with hyperaemia of the nasal mucosa and occasional purulent discharge from ipsilateral osteomeatal complex and sphenoethmoidal recess. Type II: Post-septal, orbital cellulitis. Mainstay of diagnosis is clinical judgement using a thorough history and clinical examination. History should include previous similar episodes, any history of recent upper respiratory tract symptoms or dacrocystitis. Local culture of purulent discharge from nasal passages has shown approximately a 75% positive rate however, blood cultures are usually less helpful. Increased inflammatory markers such as CRP and white cell count can aid in measuring response to treatment, but are not vital in making a diagnosis. Other important investigations include assessment of degree of sepsis through blood tests; FBC, U+E, CRP, ABG and lactate. Computed tomography (CT) scans provide imaging of the orbital contents and paranasal sinuses, allowing for confirmation of extension of disease into the orbit, identification of concurrent sinus disease, and detection of the presence of orbital and subperiosteal abscesses are useful. There is some controversy as to whether or not all patients with suspected orbital cellulitis require a CT scan, in relation to radiation exposure. Usually CT scans would prove useful in patients with concern for CNS involvement, gross proptosis and ophthalmoplegia are present, there is no improvement or concern for progression despite appropriate treatment, and surgical intervention is being considered. Some individuals have considered the use of MRI, however there are significant disadvantages including increased scanning time resulting in potential paediatric sedation and lack of MRI availability at all hours. Mild pre-septal cellulitis in adults and children older than 1 year of age, treatment is typically rendered on an outpatient basis with empiric broad spectrum oral antibiotics, provided there is reliable access to close follow-up and no evidence of systemic toxicity. However, treatment of orbital cellulitis consists of hospital admission, intravenous antibiotics covering most gram positive and gram negative bacteria, which requires consultation with local guidelines, nasal decongestants, steroid nasal drops and nasal douching. In addition to this supportive therapy with intravenous fluid hydration and analgesia is important, as well as careful optic nerve monitoring. Therefore, medical management focuses primarily on aggressive antibiotic therapy while treating underlying predisposing factors such as sinusitis. There are still arguments between early drainage of orbital abscess to prevent complications versus the possibility of seeding the infection through early surgery. Emergency drainage of the orbital abscesses and sinuses of patients of any age whose optic nerve or retinal function is compromised, and is recommended for large abscesses or extensive superior or inferior abscesses that might not resolve quickly, even if sinusitis is medically cleared. Urgent drainage is also recommended for intracranial complications at the time of presentation and in frontal sinusitis, in which the risk of intracranial extension is increased, and when complex infections that include anaerobes are suspected. Drainage can be either endoscopic or via an external approach, occasionally it may necessitate both. Following recovery, most patients receive oral antibiotics on discharge for varying periods of time to clear any residual sinusitis. Complications can be divided into visual-related complications and life-threatening intracranial complications. The incidence of associated complications was especially high in the pre-antibiotic era, with 17% mortality due to meningitis and a 20% rate of blindness. The rates of vision loss and overall mortality are now respectively 11% and 2.5%. Orbital cellulitis is a condition that rarely causes complete loss of vision if treated in a timely fashion, however there is still a risk even in modern day. Involvement of the optic nerve may produce papilloedema or neuritis with rapidly progressing atrophy resulting in blindness. Factors affecting atrophy include mechanical pressure, compression of arteries and appearance of necrotic areas on the optic nerve. There are also less troublesome but sometimes long-lasting functional and aesthetic sequelae, such as residual asymmetrical eyelid opening, impaired ocular motility, and eyelid inflammation. Neurological complications include encephalomeningitis, cavernous sinus thrombosis, sepsis, and intracranial abscess formation. Patient with intracranial abscess may be asymptomatic or present with nausea, vomiting, seizures and change in mental status. Neurological signs of intracranial abscess may include fever or altered mental status. Sinus infections are a common cause of intracranial abscess, the most common being frontal sinus, followed by ethmoid and maxillary sinuses, however spread of infection can also occur due to valveless veins interconnecting the orbit with sinuses, eyelids and cavernous sinus. (1) Mouriaux F, Rysanek B, Babin E, Cattoir V. Orbital cellulitis. J Fr Ophtalmol. 2012 Jan;35(1):52-7. (2) Gogri PY, Misra SL, Misra NS, Gidwani HV, Bhandari AJ. Neonatal orbital abscess. Oman J Ophthalmol. 2015 May-Aug;8(2):128-31. (6) Pakdaman MN, Sepahdari AR, Elkhamary SM. Orbital inflammatory disease: Pictorial review and differential diagnosis. World J Radiol. 2014 Apr 28;6(4):106-15. (8) Lee S, Yen MT. Management of preseptal and orbital cellulitis. Saudi J Ophthalmol. 2011 Jan;25(1):21-9. (9) Mouriaux F, Rysanek B, Babin E, Cattoir V. Orbital cellulitis. J Fr Ophtalmol. 2012 Jan;35(1):52-7. (14) Baring, D. E. C., and O. J. Hilmi. “An evidence based review of periorbital cellulitis.” Clinical Otolaryngology 36.1 (2011): 57-64. The presence of an intra-orbital abscess peri-orbital cellulitis is what stage in Chandler classification? Peak occurrence is seen in which seasons? What percentage of children with sinus related infections develop peri-orbital cellulitis? What is a Type V Chandler's Classification Orbital celluiltis? What is the rate of vision loss in patients with orbital cellulitis today? Infection of which sinus carries the highest risk of intracranial spread?